So, you thought you were getting a technical marvel of an action game in Eisenhorn: Xenos ($5.99)? Wrong! This adaptation of the 2001 novel set in the ever-expansive and convoluted Warhammer universe, starring inquisitor Gregor Eisenhorn, has disappointing combat, and the game largely tries to hide it and convince you that it’s unnecessary. Instead, this is about telling the story from the novel, featuring Mark Strong as Eisenhorn, while presenting some gorgeous backdrops, with you at the controls driving the narrative. And if Warhammer lore is your bag, this is a game for you. As an action game? Eh. 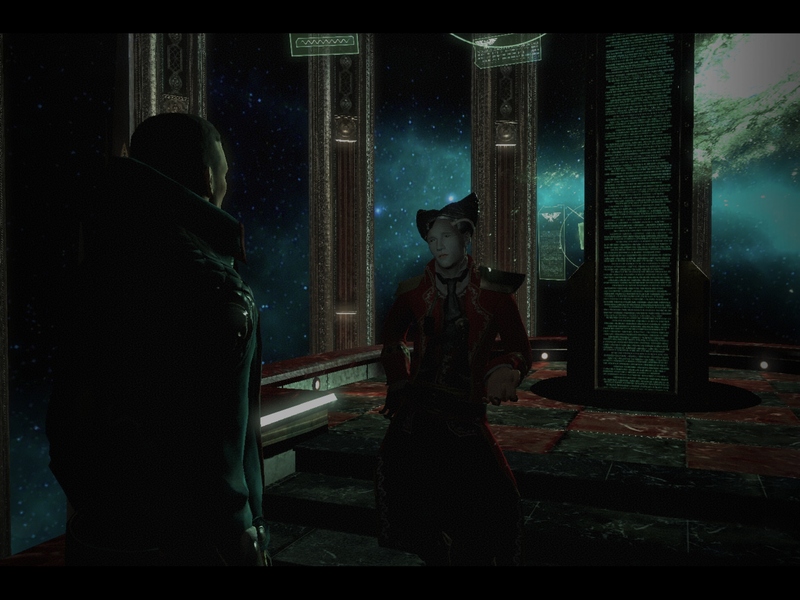 Eisenhorn: Xenos‘ combat plays a lot like something that would have released on consoles 10 to 15 years ago, and I don’t mean that in a good way. You can attack with your sword, but nothing fancy as far as combos go that button mashing that button won’t do for you. Your projectiles have limited ammo, but killed enemies drop additional bullets, so you can fire with impunity, pretty much. You have a psychic knockdown attack that you can deploy, which is kinda useful if you’re in trouble. A dodge roll can be used to get out of the way of attacks. Also, you can trigger “Pause for Breath" mode, which is basically like VATS in Fallout. The problem with the combat is that it’s so limited and clunky. At best, you don’t have a lot of options, so it’s not very engaging to play with. 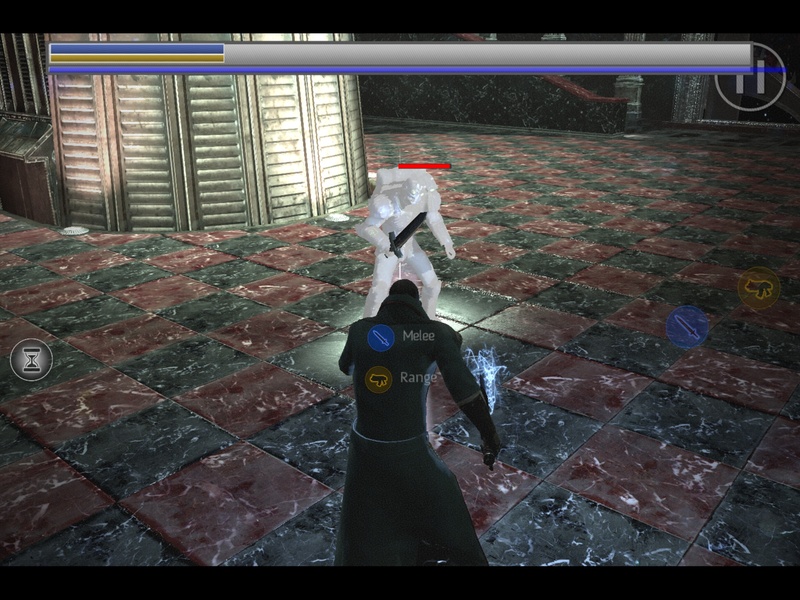 Plus, the camera makes it tough to see in combat, so you’re fighting visibility as well as the enemies. I admit to expecting something more akin to a God of War type game on iOS, but instead I got a game where combat is limited and dull. And what’s hilarious is that the game itself seems to encourage you to avoid it as much as possible. See, you can play stealthily, and use psychic abilities like Provoke to draw enemies to different spots, and take them out with stealth kills. The game incentivizes these assassinations by giving you more coins than for engaging in normal combat. Honestly, I think this would have been better as something of a Telltale game (with Telltale becoming to narrative adventure games with limited interactivity what Kleenex is to facial tissue) instead of an action game. The strengths are clearly in the performances, dialogue, and the world-building, why not make that the center of the game? As it is, the whole thing feels weirdly balanced between being an action game and being a narrative experience, and not doing well at either. The game doesn’t hold its action up in very high esteem, and gives you long narrative sections, along with lengthy portions where you’re wandering around, scanning items, or solving basic puzzles to advance the story. The plot of Eisenhorn: Xenos is…well, incomprehensible if you don’t have a good grasp on Warhammer already, or with Inquisitor Eisenhorn. The game starts off by chasing some ne’er-do-well named Eyeclone through…some kind of people vault, basically? 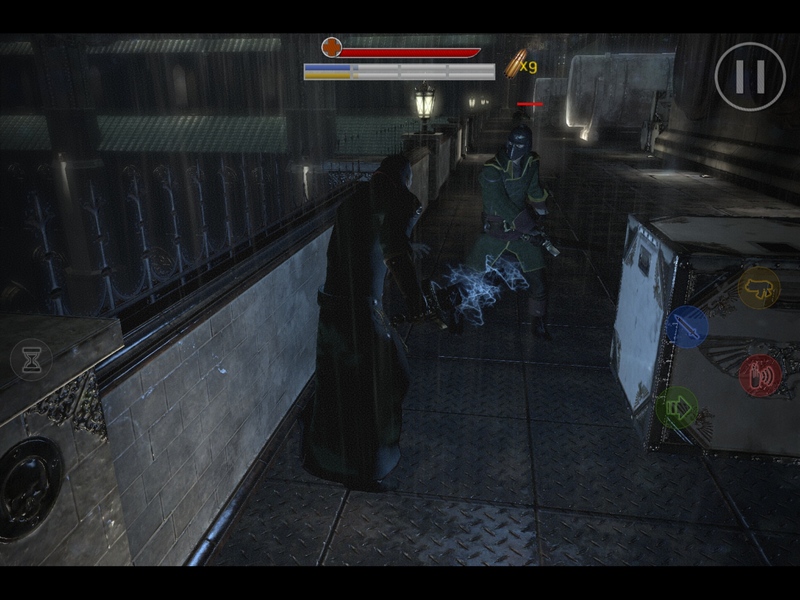 Eyeclone wakes a bunch of hibernating people up way too early, and they pretty much all die, and Eisenhorn executes Eyeclone. 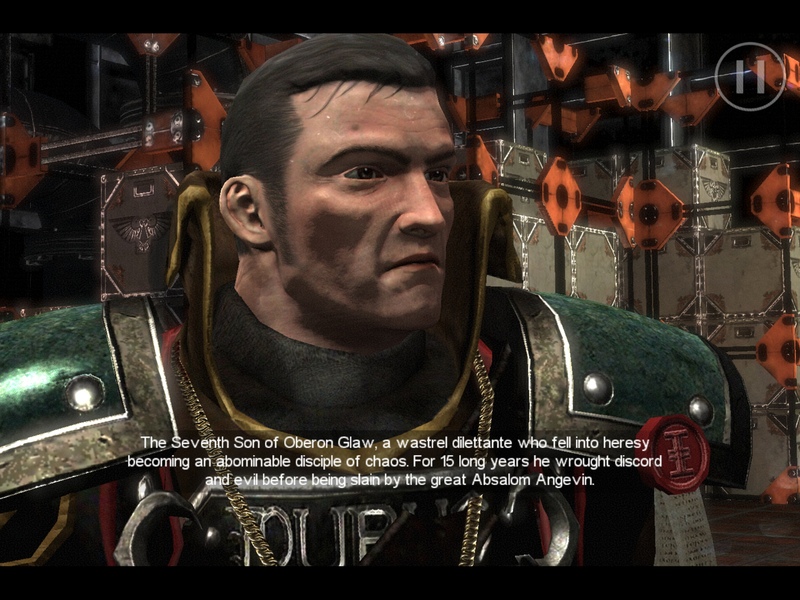 However, the fallout from this, and clues hinting at some bigger plot leads Eisenhorn and his crew down a trail that has him traveling across the galaxy, dealing with people up to no good, and just generally yelling sternly at other people who are also yelling sternly about their place in this wacky, too-serious universe. Frankly, if you don’t have a familiarity with the source material, Eisenhorn: Xenos does not care. You’re along for the ride, just hope that everything makes sense. Trying to do some research on the game, what I saw were some people who appreciated the Easter eggs and lore that are present in the game that I otherwise glossed over. Eisenhorn: Xenos knows its audience, it’s specifically for the people who want an adaptation of a 15 year-old book in a universe with tons of licensed properties as it is. And that’s fine, but if you’re not familiar…it’s kind of like if you played Infinity Blade 2 ($6.99) without reading the novel that took place after the first game. You’re gonna be lost, there’s a lot going on and the game just kind of expects you to go with the flow, or to do a lot of supplemental reading. Thankfully, the game does provide a bunch of supplemental reading through logs that you can find that contain tons of data that talk about the universe of the game. The game is fully voice-acted, and stern-voiced British man Mark Strong is perfect for the role, being tough but thoughtful when need be. The other actors do a good job with the material they’re given, and that’s not a knock on the quality of the material per se, just that it’s pretty much inaccessible without any outside knowledge. I could imagine that this would be like if the movie adaptation of The Hunger Games didn’t actually set up the world and just started with Katniss in the hunger games, and advanced from there, with the expectation being that you know what’s going on. No – a little more grounding and explanation for people who don’t know what’s going on is rather necessary. But I suppose if you already know the basics, seeing it all adapted is fine, and I know Warhammer fans can be quite…obsessive about the license. Maybe Pixel Hero just knows their audience. I wonder if there was an identity crisis with this game in the development – the GDC demo was impressive because the game was a technical achievement, and it still is. Seriously, this game is gorgeous, and Pixel Hero throws in plenty of moments to admire some stunning views. That, and there’s some great visual effects in use here. Pixel Hero made one of the most gorgeous games on iOS, and it shows. Plus, it has MFi controls and iCloud support, this was made with care with mobile in mind. Maybe keeping this as a mobile-friendly game would have been tough if the combat was specifically expanded at some point. Or maybe I have high standards for an otherwise-ambitious project from an independent developer. But I see where the strengths of this game lie, and they’re not in the combat. Maybe this is just brilliantly subversive – a game in a violent universe that gets you to abhor the actual combat. And so, with the strength being the delivery of a tough-to-understand narrative, this is another Warhammer game that. Much like Blood Bowl ($4.99), you need more than a surface-level understanding of Warhammer to understand this game. If you’re a big fan of the Eisenhorn: Xenos novel already, then this is perfect for you. Otherwise, the redeeming value is practically nil. I get that Games Workshop will give the Warhammer license to pretty much anyone (though not me if I keep badmouthing their stuff), and I don’t know if it’s smart for these games to be so intentionally obtuse to newcomers, or stupid as they’re putting off audiences that could otherwise get suckered into this whole, expansive universe. This game, like many Warhammer games, gives plenty of signs that there’s a huge, interesting universe, it just needs to do more to be welcoming to someone who’s curious enough to find out more, but wants some guidance. And the rest of the experience isn’t good enough to really justify non-Warhammer fans checking this out. Oh well, maybe next week’s Warhammer game will do a better job at that.